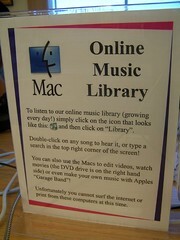 While at the Cherry Hill (NJ) Public Library for Michael's workshop today, I was walking around and noticed these computer workstations loaded with iTunes. The sign next to them explains it all. They've ripped their entire music collection into iTunes and made it available for patrons to listen to (on headphones, natch) before they check out materials. Awesome! Talk about meeting a need. Nicely done, Cherry Hill! Do they download the music onto their ipods or do they just stand at the station and listen to the music? I can't seem to post with my ID but I do have one. They have four computer stations set up, but you don't have to stand -- they have chairs at the stations. No music on iPods to my knowledge.